In the small New Jersey town where I grew up, our closest Chinese restaurant was housed in a defunct IHOP. So I’m always enchanted by the opulence of the old school, pagoda-style Chinese restaurant architecture. However, I’m also leery of the nostalgic allure of a building’s façade. It doesn’t always translate to the kitchen. A “vintage” exterior can simply mean “tired” within. The distinctive shrine to Chinese cuisine at 550 W. Tudor Road has never made it onto my culinary radar. If my car was in the parking lot, it was because I was eating quiche next door at Doriola’s (RIP). The fact that the business seemed to change hands often didn’t help. Which is a circuitous way to explain why I was unaware that the well-established Jimmy’s Sushi Restaurant had taken it over. An astute reader let me in on the much-too-well kept secret: Jimmy’s has an extensive menu of authentic, Szechuan cuisine. These, to me, were magic words. Of course, my motto is, “trust but verify,” especially if the verification process means eating noodles and double-cooked pork. My daughters bravely volunteered to help me with my mission. Behind the vintage façade is a newly renovated and gleaming clean dining room. The atmosphere is serene and comfortable, with spacious booths, soft lighting and quiet music. The menu is a virtual tome, with extensive options under sushi, Japanese cuisine, Chinese cuisine and Thai specials. But I was laser-focused. I was there to eat classic Szechuan dishes. We ordered a rice dumpling ($5), Mapo tofu with minced pork ($15), an order of Kung Pao chicken ($12 as a lunch special), and some Dan Dan noodles ($12), with a tacit agreement to share. We began with the rice dumpling — a menu item that was entirely new to us. This little dish arrives at the table gift-wrapped in bamboo leaves tied with twine. After taking turns untying the little bundle, the leaves opened to reveal a beautiful dumpling of sticky rice hiding another gift of shredded, savory pork within. This is a Russian doll of a dish and utterly delightful. Jimmy’s Kung Pao chicken is a solid version of this ubiquitous and well-loved dish. 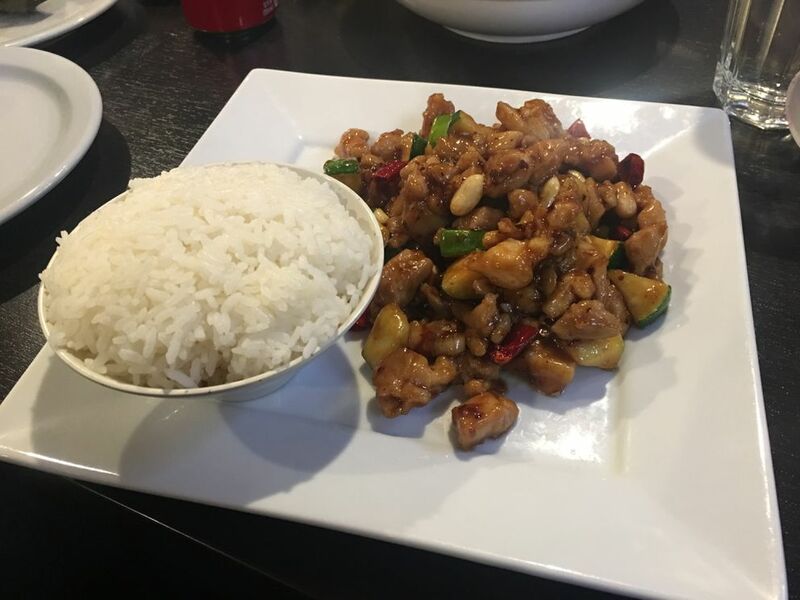 Flavorful bites of gingery chicken were sautéed with dried red chilies, scallions and studded throughout with peanuts. This dish perfectly hit the trifecta of salt, sweet, and spice. The Dan Dan noodles were also a hit. 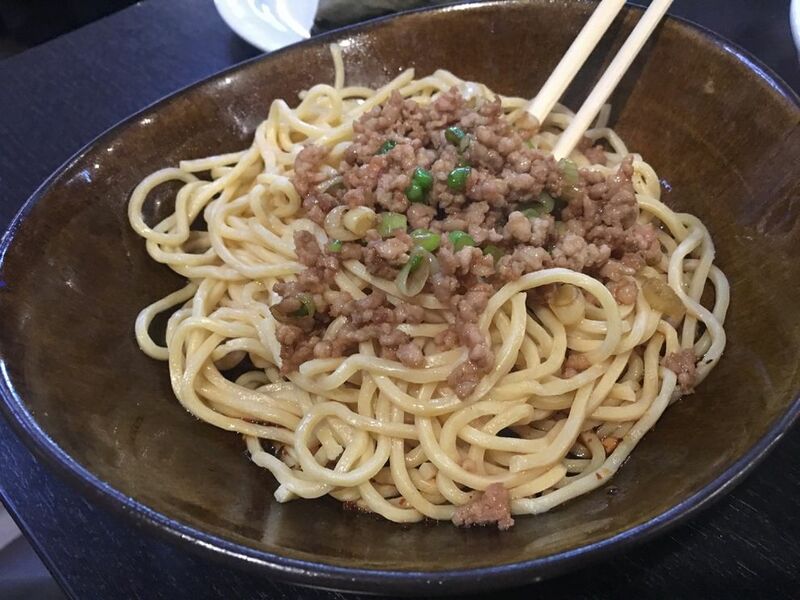 This tangle of dense, chewy noodles was lightly blanketed with minced pork, smoky chili oil and scallions. My youngest tried to commandeer the bowl to herself, but her sister and I are both extremely handy with chopsticks and managed to foil her efforts. Nice try, kid. 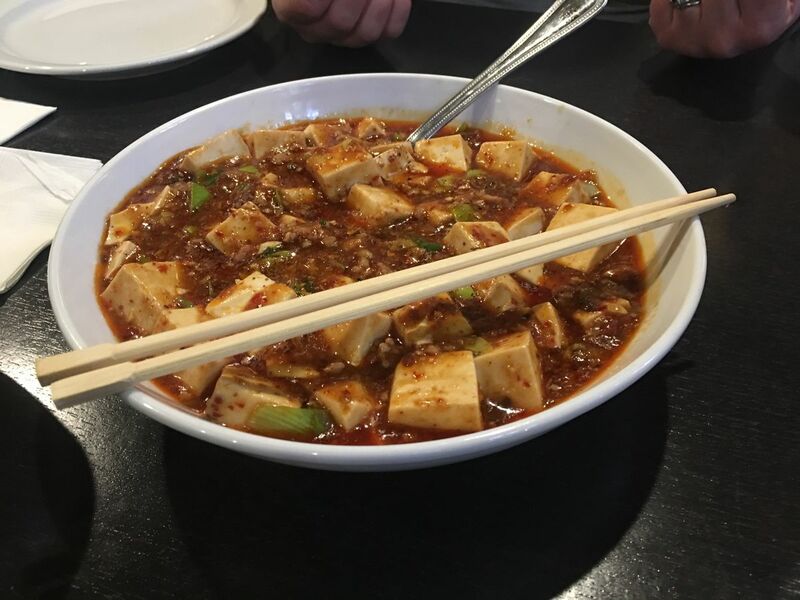 But it was the Mapo tofu — recommended by the aforementioned reader — that was the star of the meal. Eaten on a particularly nippy February day, the fiery color of this chili-oil-laden dish is enough to warm you up even before the first bite. Aromatic and spicy, this stew of cubed tofu and minced pork is comforting from the inside out. The tofu is creamy and silky; the pork lends texture and savoriness. The custardy quality of the tofu is the perfect foil for the smoky heat of the sauce. I could eat this every day. The following week, I let Jimmy’s do the cooking and ordered takeout for a weekend family dinner. We ordered the double-cooked pork (another dish recommended by my alert reader, $18), sautéed lamb ($24), fried chicken with dried pepper ($18), fried string beans with minced pork ($16), and cold sesame noodles ($12). The only dish that we didn’t absolutely love was the fried chicken. It was just as described: battered, fried nuggets of chicken sharing a plate with a generous helping of dried chilies. But those qualities — crispness and dryness — make this, unsurprisingly, a dry, challenging dish. I cherry-picked the peppers out to spice up some of the other dishes but the chicken went largely ignored. Both the lamb and the double-cooked pork were delicious — well balanced and complex, with a sauce that is velvety in texture and assertive in spice. That said, these are similar dishes and the sauce somewhat overwhelms the subtle earthiness of the lamb, the more expensive of the two dishes. In other words, if you’re a cheapskate like myself, you might want to give the lamb a miss in favor of the buttery, savory pork belly which hits all of the same flavor profiles. I should also note that the online menu listed the lamb at $20 but we were charged $24 at pick-up. So you might want to double-check the prices when placing a take-out order. One of the best bites of food I’ve ever eaten was a plate of sautéed string beans with minced pork eaten in San Francisco’s Chinatown just a few years ago, and I’ve been chasing that high ever since. Happily, these did not disappoint. The beans are cooked quickly and at a high heat so that they’re charred, blistered and a bit dehydrated – concentrating their earthy flavor. The pork adds savoriness and texture. This is a dish that makes it easy to eat your vegetables. Cold sesame noodles are a dish I make often. They came free from most New York City Chinese delivery joints so, needless to say, we ate them weekly. I’ve been trying to capture that perfect blend of creamy, sweet, and spicy, ever since we moved to Alaska. I thought my version was pretty good until I saw my daughter, who usually turns her nose up at mine, scarf down Jimmy’s version. “I’ll have to start making these for you,” I said, cheerfully. “No, that’s OK,” she replied. Ouch. Everyone’s a critic. “Where can I get good Chinese food” is one of the questions I’m most frequently asked. I’m glad to add Jimmy’s Asian Food restaurant to that very short list.